Last week the brilliantly colored fall leaves were still on the trees. This week the trees are increasingly bare. As the leaves pile up underfoot, food thoughts change from the flavors of fall to the baking frenzy of the holiday season. Before we dive head first into the land of peppermint and gingerbread, there is Thanksgiving to be savored. 3-D Turkey Cookies, “painted” in seasonal colors, are crunchy, iced, edible art for Thanksgiving gifting, holiday table decorating, or care package mailing. It’s turkey time! 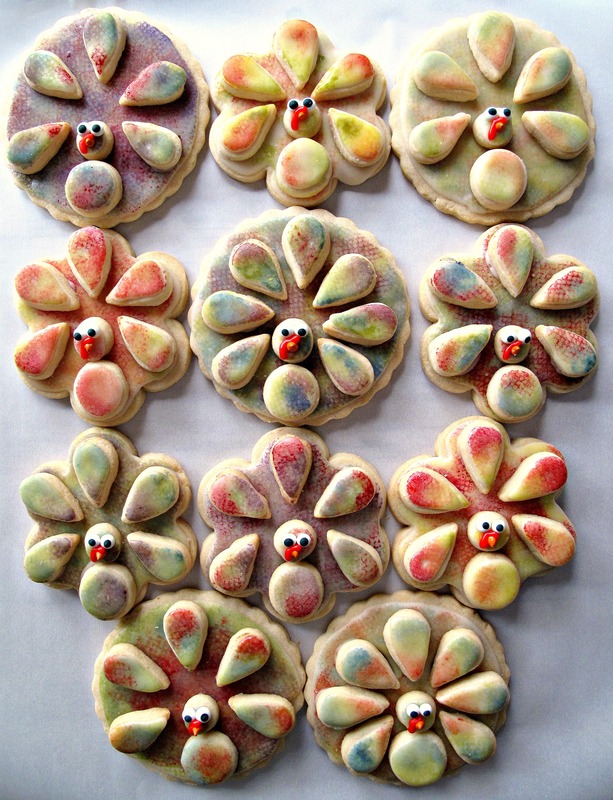 Last year I made turkey cookies that winged their way all the way to Afghanistan! This year, my turkeys are staying closer to home. Those who have followed my military care package posts may have noticed their absence lately. I am delighted to share that Soldier B., my second adopted troop, has safely returned home! It’s wonderful to know that Paratrooper Derik and Soldier B. are home with loved ones this Thanksgiving. Unfortunately, because I didn’t know Soldier B. was returning home until he was already back, I wasn’t able to ask him to get me the name of a troop who might enjoy Monday Box care packages. Packages sent to troops no longer deployed, are either thrown out or returned, so my Afghanistan shipments are temporarily on hold. I am investigating options for continuing the tradition of sending ”thank you” care packages to deployed troops, and hope to share military care package ideas again soon. 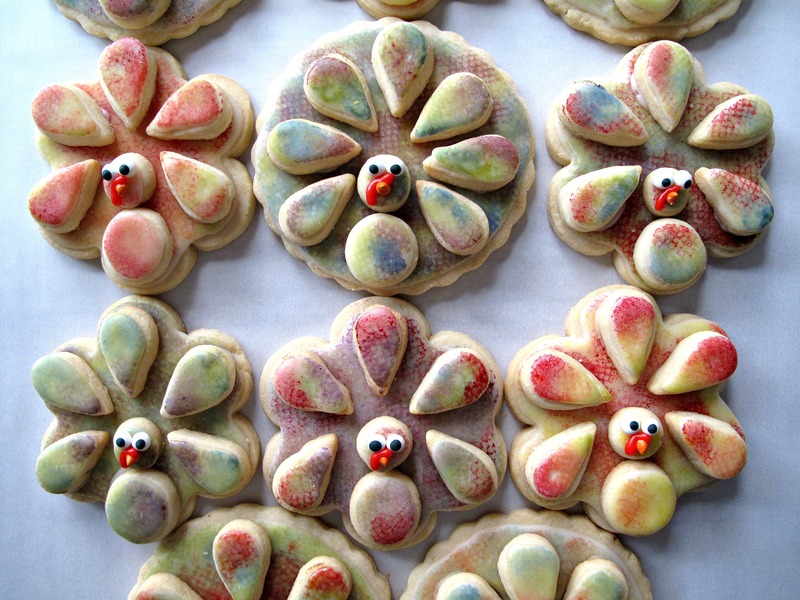 These 3-dimentional turkeys were inspired by a recipe for stained glass cookies in “Rose’s Christmas Cookies” by Rose Levy Beranbaum. Stained glass cookies are beautiful to look at, but I am not sure that they are meant to be eaten. Cookie dough plus melted Jolly Ranchers is, in my opinion, disgusting. It’s all crunch, crunch, stick in your teeth, fruity, then cookie. I was not impressed with the flavor and texture combination. I was impressed though, with the cookie dough. The cookies are crunchy with a light citrus-vanilla scent. They are great make ahead cookies and store (or ship) beautifully for at least 2 weeks. For 3-D Turkeys I kept the dough and left out the candy. Instead of candy for color, I sponge painted the cookies with natural food coloring. Sponge painting is the technique I used for Gingerbread Fall Leaves. Preparing the cookies takes a little time and planning, but the actual decorating is just as easy as the sponge painting kids do in preschool. The watercolor look and the texture is created using paper towel daubers to dab food coloring on top of dry white icing. India Tree makes natural food colors (no chemicals) that produce beautiful muted fall colors, perfect for fall leaves and turkeys. Regular food coloring can be used, but the colors will be brighter with a slightly less watercolor effect. Three inch round or flower cookie cutters are used to cut out the background feathers cookie. 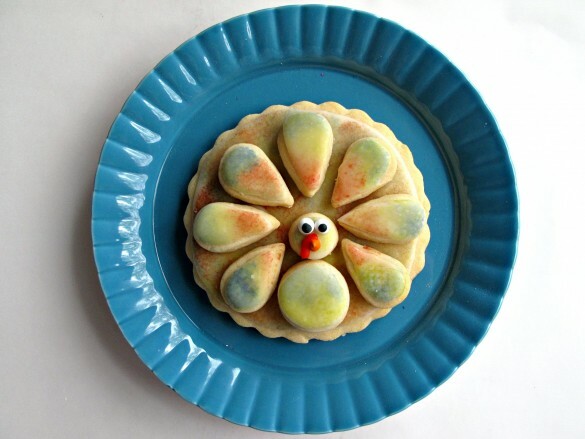 The turkey head and body, as well some feathers, are “glued” onto the base with icing to make a 3-D cookie. 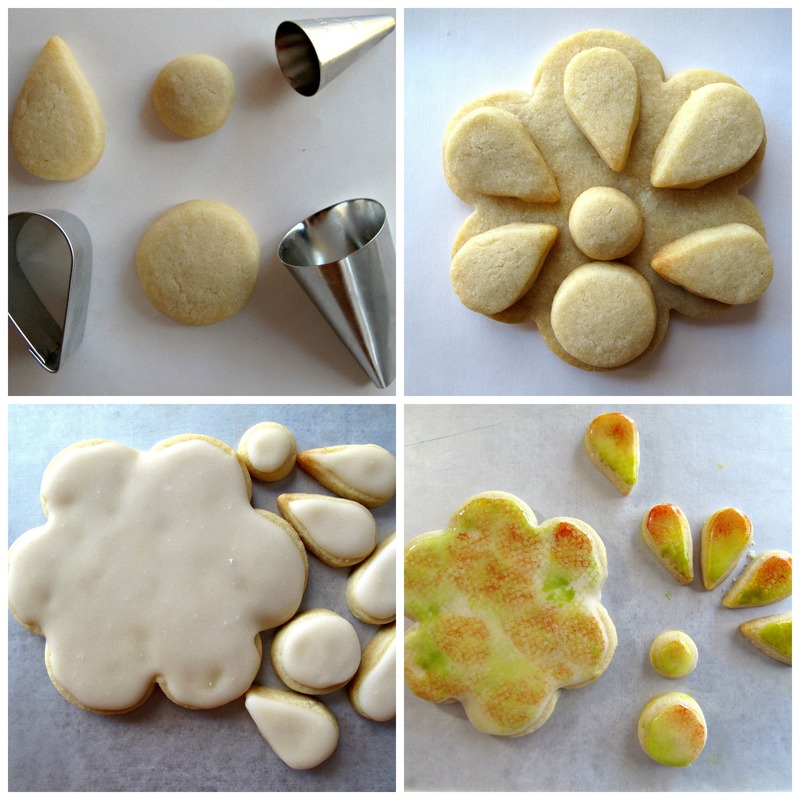 A large and a regular piping tip are used as improvised cookie cutters for the head and body. A teardrop shaped canape cutter is used for the feathers. Add candy eyes and an orange rainbow chip sprinkle beak and you have a 3-D turkey! Each colorful cookie is a unique work of delectable art! They are super for care package travel, whether the destination is nearby or across the globe. Packaged in individual clear plastic gift bags, these 3-D turkeys would also make great gifts or edible decorations on a Thanksgiving table. In the bowl of an electric mixer, cream together the butter and sugar until light and fluffy. Form the dough into a disc, wrap in plastic wrap, and refrigerate until firm (30 minutes- overnight). Use ½ of the dough at a time, keeping the remaining dough refrigerated until ready to use. Between two sheets of plastic wrap, roll out the dough to 1/8 “ thickness. 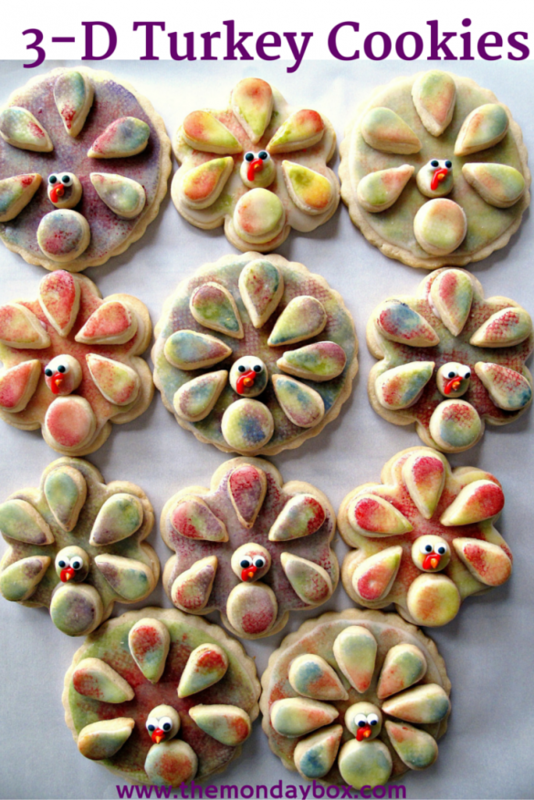 Remove the top plastic wrap and cut out cookies, 5 tear-drop shaped feathers for each cookie, and 1 head and 1 body circle for each cookie. Place cookies on the prepared baking sheet about 2” apart. The large cookies should be baked separately from the feather and head/body cookies. Bake for 10-12 minutes until the edges begin to turn golden brown. The small cookies will require less time than the larger ones, so should be baked separately and watched carefully to avoid burning. Allow the cookies to cool 10 minutes on the baking sheet before removing to a wire rack to cool completely. Remove ¼ cup of icing into a small bowl. Color the icing red, then place in a piping bag with a very small round tip (Wilton #2), or cut off a tiny corner of the bag when ready to add the red icing over the turkey beak (snood). DECORATING (ADDING COLOR): You will need 1 paint dauber for each color. To make paint daubers, cut a paper towel sheet into 4 pieces. Scrunch a piece of plastic wrap into a ball and place at the center of a paper towel square. Twist the paper towel around the plastic wrap and secure with a twisty tie. Dispense about 5 drops of each color food coloring onto a plate. Leave room between colors. Moisten a dauber slightly in the water. Dip the dauber in a food color, blot off excess color, then pat onto the cookie. Use a different dauber for each color. Cookies should be dry before they are stored. Drying time varies. 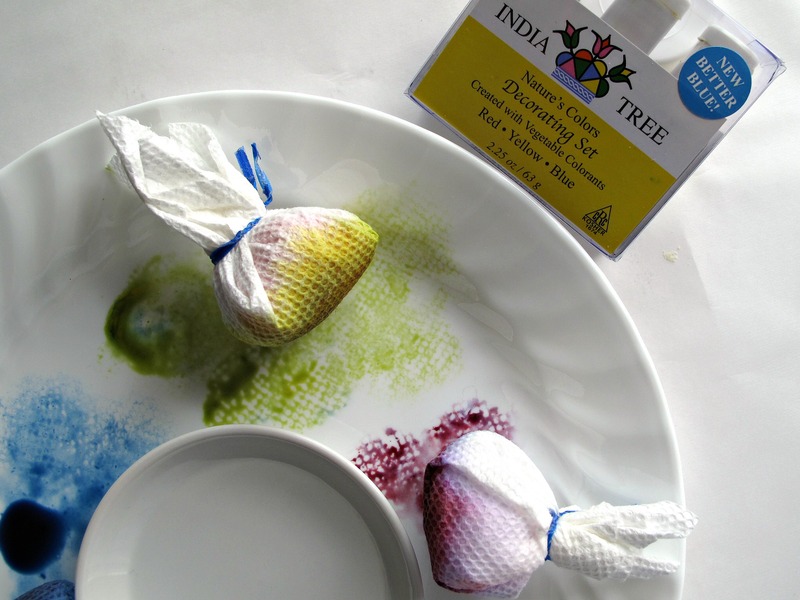 My India Tree natural food colors required overnight drying. 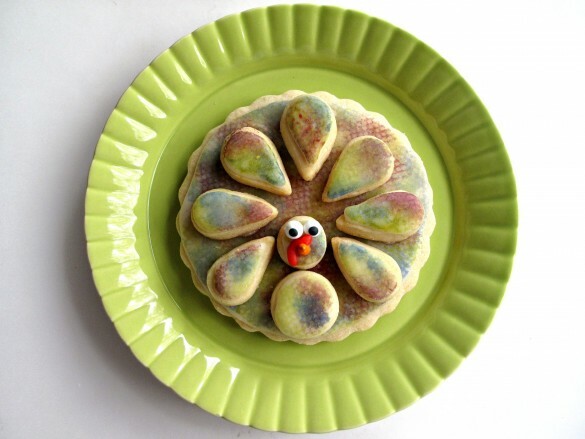 When the coloring is completely dry, the body, head, and feathers can be “glued” onto the cookie using the icing as glue. Add the eyes and beak. Use the red icing to pipe on the snood (the red thing that hangs off a turkey beak). Allow the icing glue and snood to dry completely (1-2 hours) before wrapping or storing. Double wrap each cookie in plastic wrap, then place in an airtight container or zip lock bag. Use crushed tissue paper or other packing material to assure that the cookies do not move during transit. « Halloween Pretzels- easy, fast and fun! Thanks so much, Ada! You are THE cookie lady, so your compliments mean a lot to me! These are great! I love fun food and am always looking for neat ideas. These are really, really nice. Pinning! Wendy, these cookies are so creative! I love that you sponge painted them with natural food colors. Pinning for later! Thanks, Elaina! The colors from the natural food colors are perfect for fall themes (leaves, turkeys, etc.). Thanks for pinning! These cookies are just too fun Wendy! I love that watercolor look – I would have never thought to try that! Wow! Those are so cute and look very easy to make. I may have to give them a try next weekend with my two boys. Thank you, Tennille! The boys can definitely do most (if not all) of these cookies. They might get bored with the white icing part, but are sure to have a great time sponge painting and gluing the turkeys together! Very cute and perfect for Thanksgiving! Gobble gobble! 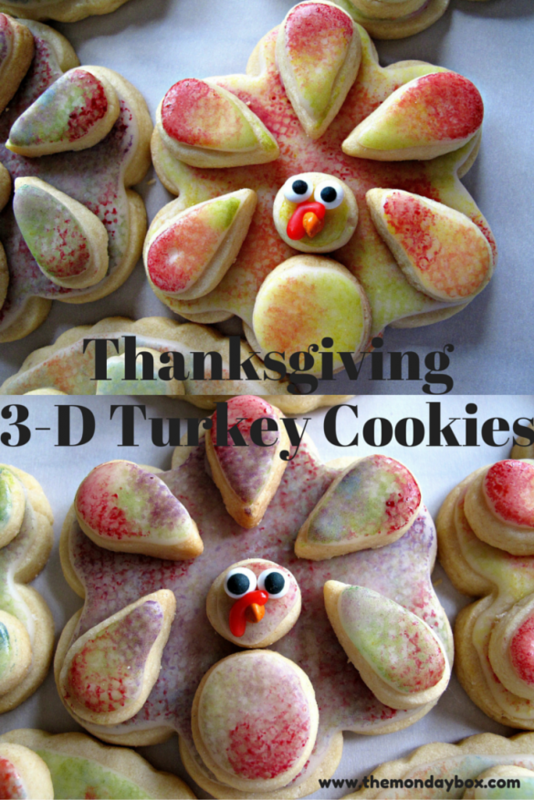 These 3D cookies are so impressive…they would make a great favor/gift for guests to take home after Thanksgiving dinner. I’d love to see them on the Thanksgiving table and eaten (if anyone would have the heart to eat them!) as dessert. You’ve got the sponge painting down! Ok I’m not a huge baker, but these are so stinking adorable — talk about the perfect holiday treat/fun kids activity! I’m going to give these a shot but I might clean up the ingredients a bit — we’ll see how almond flour holds up in the cookies and I’m thinking a coconut milk or avocado frosting :)! Thanks for the adorable idea! Thank you, Lindsey! My daughter has to eat gluten free, so though I don’t blog about it, I do collect and try out gluten free baking recipes. I have used one for Cut-Out Coconut Flour Cookies and I think you could easily make coconut flour turkey cookies with this dough. 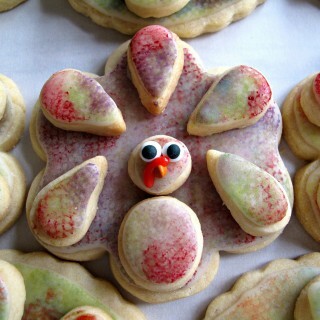 ( http://www.healthextremist.com ) Have fun baking and happy Thanksgiving! These are so cute and look great! Mine would probably show up on a Pinterest fail board, but yours are fab! 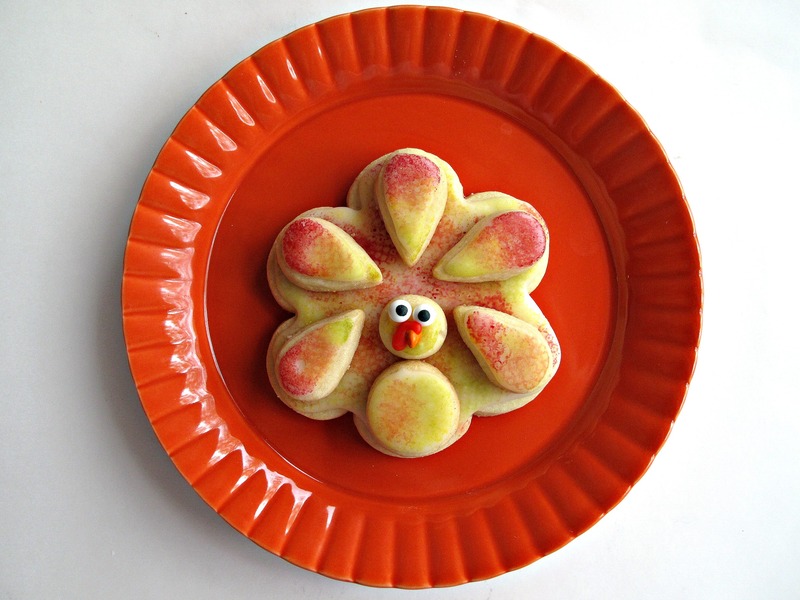 Awww… These turkey cookies are ADORABLE! They would be really great gifts. Hope you are going to figure out the care package situation soon. I am sure that they are missing your baked goods. 🙂 By the way, I love your new profile picture! It is a really nice picture of you. Well if these aren’t just the cutest thing! I am putting them on my must make list! I’m so glad your soldiers are all safely home, Wendy. Love these 3-D Turkey Cookies – how perfect are they for Thanksgiving!! Your step by step instructions are wonderful too. Sharing on Pinterest and on the H&S FB page later today. Thank you so much for being a part of the Hearth and Soul Link Party. Thanks, April! There are always new soldiers to adopt and send care packages to! Thanks for hosting Hearth and Soul Link Party! 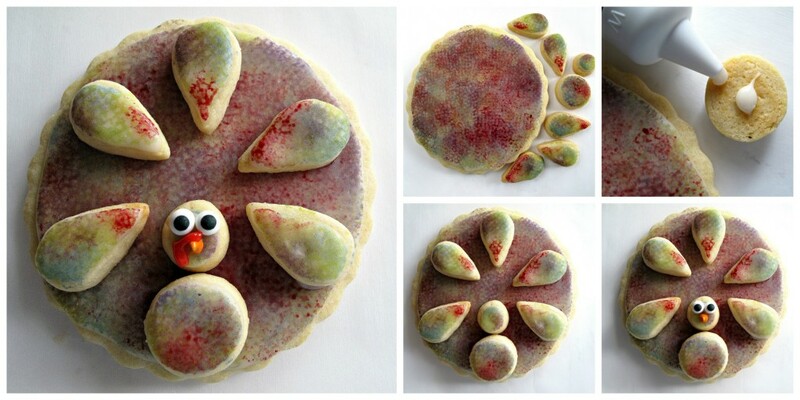 Love these turkey cookies. My kids will be thrilled with them this Thanksgiving. Look at AnySoldier.com to find more deployed service members that will appreciate care packages. I’ve sent many carepackages using Any Soldier. Thanks for sharing at the This is How We Roll Link Party. 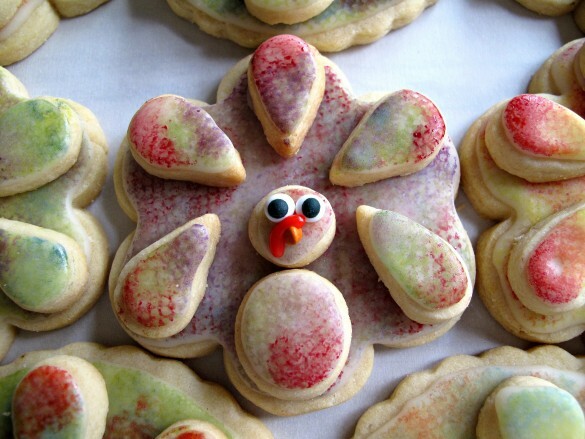 Your turkey cookies are adorable and I love that you used natural food coloring on them. We’ve moved past gorgeous autumn leaves and onto snow, unfortunately. I’m not ready!! These are sooooo cute. How fun to make with kids! So cute. Congratulations on the feature on Classy Flamingos. What fun cookies! Thanks for sharing at the What’s for Dinner party. Hope to see you again tomorrow. Thank you, Helen! Thanks for hosting your fun link party!